Welcome to the best condo at the North Creek Resort (NCR) located at the base of Blue Mountain. Great views of the North ski hill and a small waterfall are at you doorway. It is a 20 minute walk (1.5 km) to the Blue Mountain Village or hop on a free bus if you prefer a Shuttle ride. 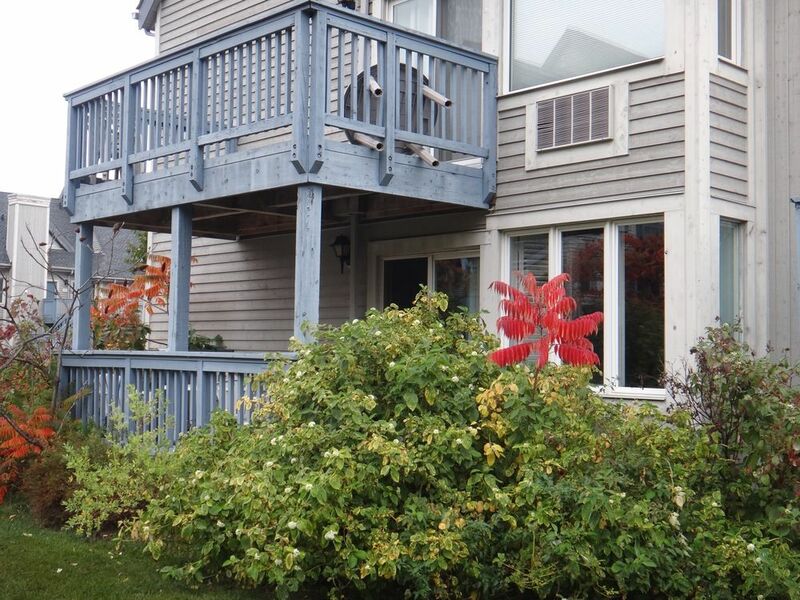 This bright, ground level condo provides a spectacular view of Blue Mountain and two beautiful decks. A small stream flows around the outside of your private bedroom. This 554 sq. ft. chalet has one separate bedroom, and a new leather LazyBoy sleeper-couch in the living room which doubles a a comfortable queen sized bed. Recent upgrades include a new fireplace, marble backsplash, granite counters, carpeting, furniture, two high efficiency HVAC units and stainless steel appliances. Lots of free parking, including underground parking, are included. My condo sleeps 4 in TWO SEPARATE, private sleeping areas. This is NOT A STUDIO (which has a bedroom in the living room). There is one bathroom with a two-sink vanity, shower and Jacuzzi whirlpool tub. The kitchen is fully-equipped with modern appliances, dishes, etc. There is a NEW, 40 inch, SMART TV which gives you easy access to Netflix, etc. There are endless activities at Blue, considered the App for details. For long weekends, preference will be given to 3 night bookings. MSR has a heated, outdoor pool and hot-tub open from the May long weekend to Labour day. Also, right outside the Chalet there is a trail that wanders up through the woods to the Bruce Trail on top of the Escarpment where you can travel for miles in either direction. A public beach is 1.7 walk/drive away. There is an endless amount of events and activities to choose from at this recreational paradise. Check out for up to minute details. During the winter, Blue Mountain offers the best skiing and snowboarding in Ontario. After a hard day of skiing, why not check out the Scandinavian Spa to sooth those sore muscles under a warm waterfall? A great, inexpensive Thai Restaurant on site. Please treat this place as if it were your own. No noise after 11 pm is strictly enforced. Please park in designated areas only. No smoking or vaping is allowed on or in this condo; violations are subject to a $500-$1000 fine. A maximum of 4 guests allowed. The property is okay but it not very clean and stuffy. The property was not very clean on check in; we had to clean the washroom, drawers and fridge ourselves. It was also stuffy and damp, doesn't get enough ventilation. If these 2 issues are fixed, it would otherwise be okay. There is an endless amount of events and activities to choose from at this recreational paradise. Check out www.bluemountainvillage.ca for up to minute details. During the winter, Blue Mountain offers the best skiing and snowboarding in Ontario. After a hard day of skiing, why not check out the Scandinavian Spa to sooth those sore muscles under a warm waterfall? Extra person fee of 50 per person per night after the first 4 guests.